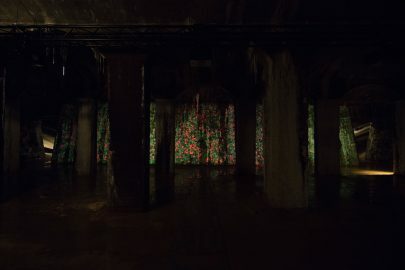 Site-specific video installation in The Cisterns, Copenhagen. 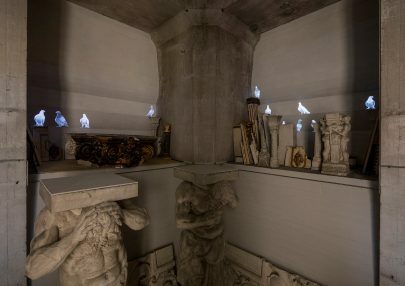 Pigeons live in the wild, but they also live in myths, in our collective memory, in poetry and in pictures. Now we are in the tower of Christiansborg Palace, the seat of the Danish Parliament. 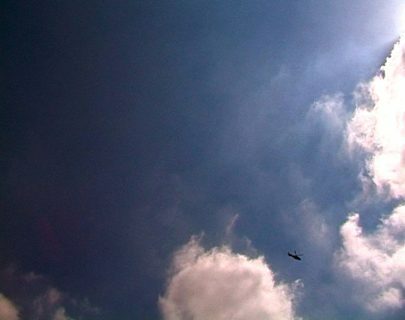 In that connection one might come to think of the fact that politicians may be ”doves” seeking compromise for the sake of a greater cause. 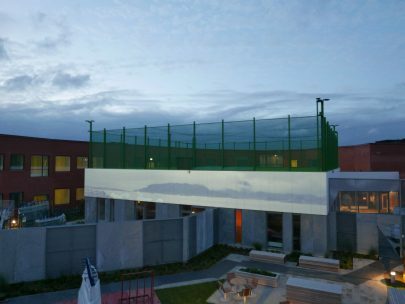 A permanent outdoor video installation and sculpture created specifically for Eriksminde Continuation School, Odder, Denmark. Much of our lives are spent waiting. For something to begin, or for something to come to an end. 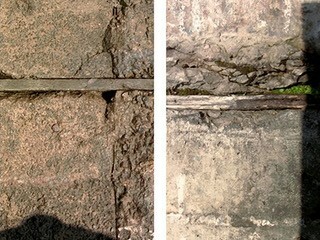 A concrete and a metaphorical self-portrait of the artist, Eva Koch. Time has been slowed down so that the human eye can follow the water’s wild, uninterrupted fall from top to bottom. 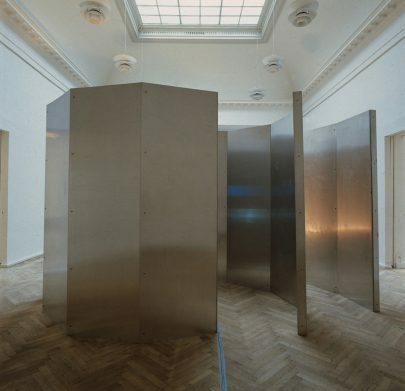 There is a certain meditative calm about it, but fierce white noise of the sound track adds a powerful energy to the impression made by the installation. Standing in front of this reproduction of a natural phenomenon that has surprisingly been moved into the centre of the city, the visitor has a physical sense of the huge forces of nature, and the smallness of his or her own body. 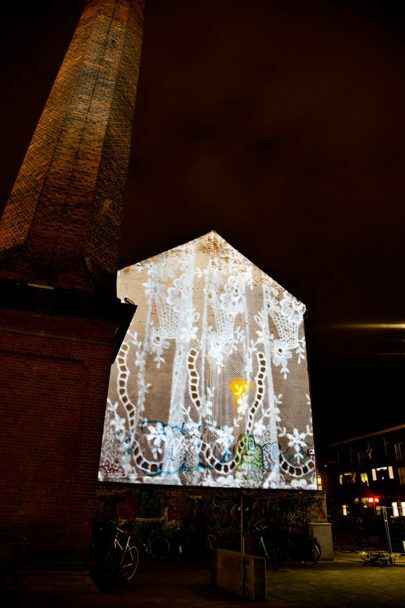 June’s Lace is an exhibition in three parts: an outdoor video projection, a video installation for three projectors and a poem. The installations can be seen as existential and philosophical readings of the lace curtain. 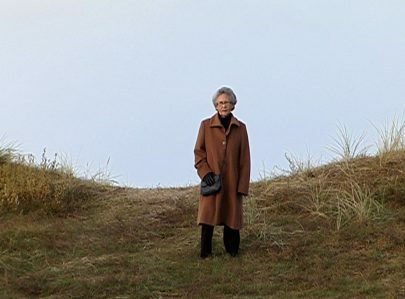 In her place-specific work “Nanna” Eva Koch uses video to enter into a dialogue with traditional sculpture, in this case a female figure modelled by the once trendsetting sculptor H.W. 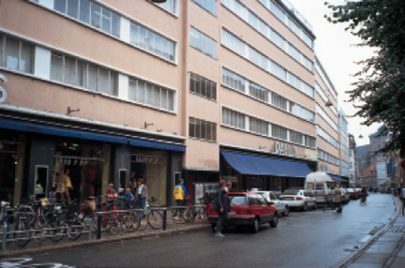 Bissen. 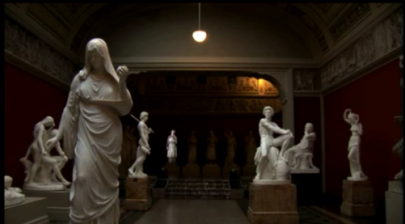 The video work Salammbô takes its departure in Gustave Flauberts novel Salammbô from 1862 and was created in a dialogue with Jean-Antoine-Marie Idracs neoclassicist sculpture of the same name from 1903 (at the Ny Carlsberg Glyptotek, Copenhagen). 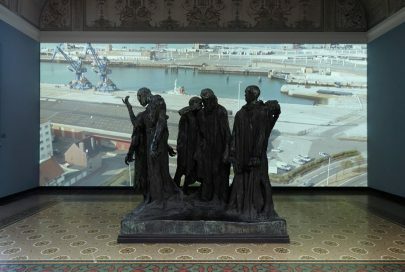 Calais is a video and sound work created for Auguste Rodin’s dramatic sculptural group The Burghers of Calais (the Ny Carlsberg Glyptotek, Copenhagen). Rodin’s work is an interpretation of the legend about the 6 leading citizens of Calais who in 1347 offered to sacrifice themselves in order to save their fellow citizens during the English siege of the city. The idea of our common humanity permeates Eva Koch’s installation Portraits from Bina. 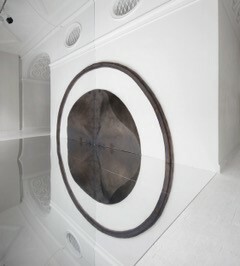 This is a site-specific work for the House of Culture in Bina, a suburb of Baku, the capital of Azerbaijan. This project aims to give Augusta a glimpse of her Greenlandic family and at the same time produce a living portrait that places the family in the Greenlandic landscape, but, as the video shows, the weather is an incalculable factor. From the earliest days the spiral has been used as a symbol, as a sign for change, growth and development. In her Sculptural Water Art Eva Koch has chosen to use the spiral to symbolise the function of the site, a place of learning. It’s almost too beautiful. 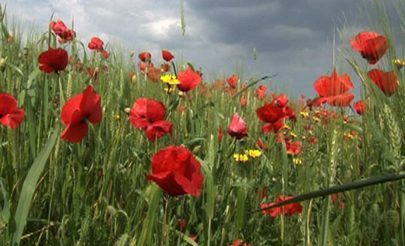 The red poppies in the wheat field swaying gently in the wind, the buzz of insects and birdsong. 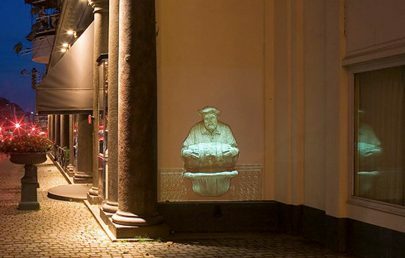 The living image of the Roman fountain Il Facchino from Via Lata in Rome hangs in the dark night of the Danish capital accompanied by the sound of quietly running water. 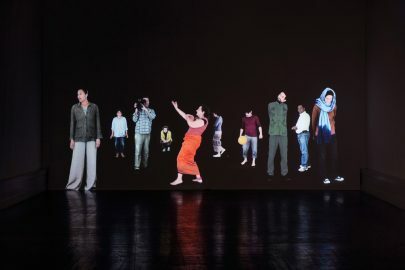 The video installation “Evergreen” is about the power of the group and about the cruelty inherent in us that can mercilessly exclude an individual from the group. 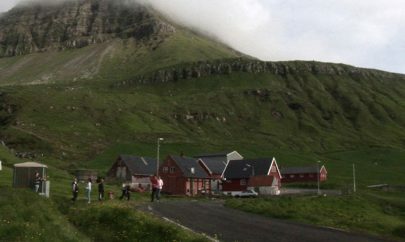 This is set in the overwhelming and beautiful landscape of the Faeroe Islands. 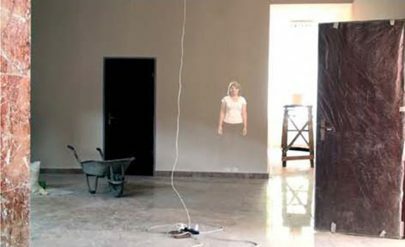 Eva Koch’s video installation Confer consists of two projections set opposite each other. On one projection we see a contrabass, which is filmed so close up that the instrument seems to be physically present. On the other projection we follow a helicopter against the background of a lightly clouded sky. There is no immediate encounter between the two pictures, a contrabass and a helicopter. 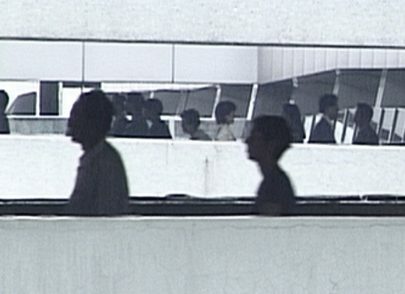 A video installation about communication. The sound track and the visuals tell the same story, but in different languages, the spoken and sign language. Caught between these two languages, we are in a field of interpretation. Even though we speak the same language, it is not given that we understand the same thing. 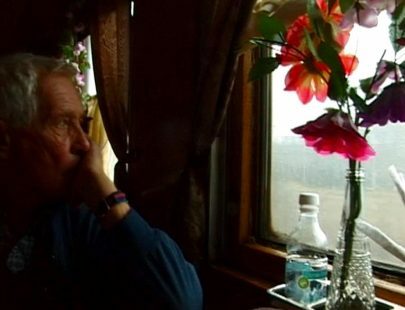 The lone experienced traveller who in the midst of the monotony of a journey on the Trans-Siberian Railway invites you to hear the tale of one of the many incidents he experienced along the way. 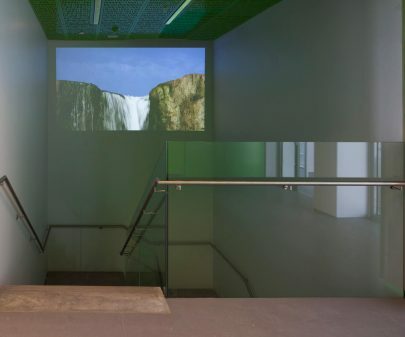 Eva Koch’s video installation UP is a loop that shows people coming up out of a subterranean shaft. 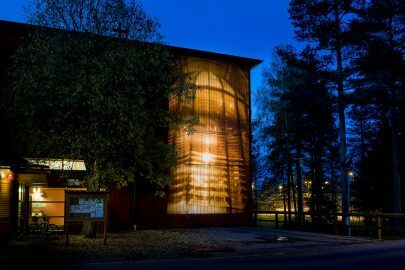 As a projection it has a diameter of about 60 cm. 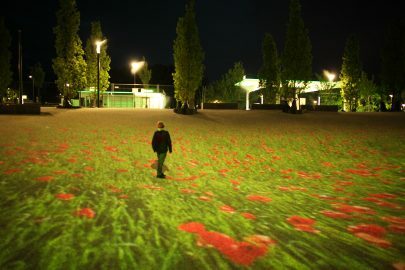 Projected onto a street or pavement where many people pass by, it will provide a moment of surprise, a little intervention that some will pass by with a quick glance, while others may pause for a moment to wonder what is going on. 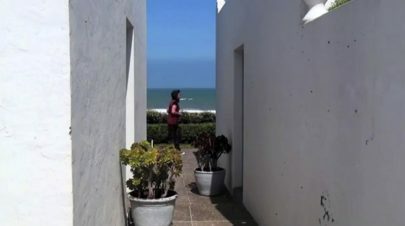 The project is a video work, divided between two blocks with each locality showing an extreme point of the ‘same’ story. 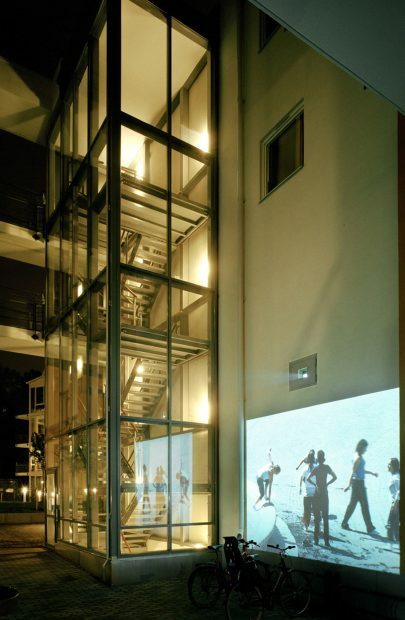 The video sequences are projected directly onto the outer walls and can be seen from dusk to sunrise. 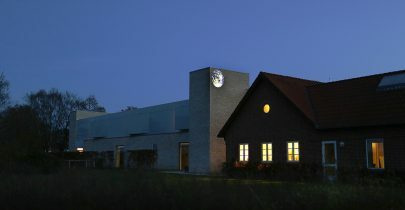 The work establishes a special experiential space as darkness falls. 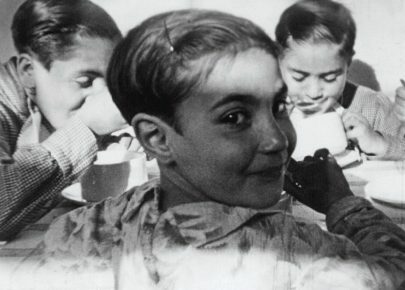 During the Spanish Civil War in the 1930s in the remote mountain village of Villar del Cobo, the children of the Martinez Lopez family were separated from each other. 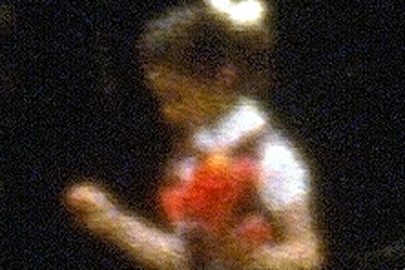 Their father had died some years earlier, and when their mother, Manuela, was hospitalized for a time, two of the children, Ernesto and Cristobalina, were placed in a childrens home in a nearby town. Before their mother was able to bring the two children home again, Cristobalina was adopted by a Norwegian relief worker. 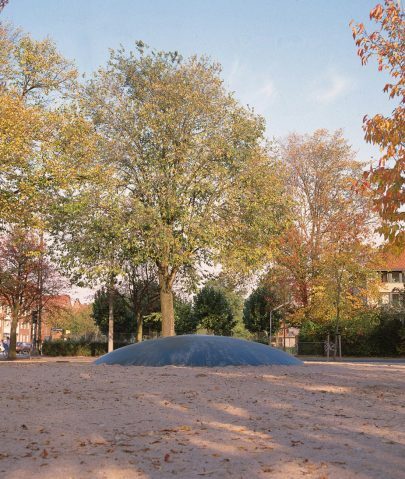 The project consists of an approximately 30-metre high mound with a diameter of about 280 metres. 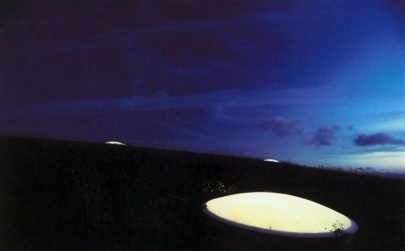 Inside the mound at surface level there are 19 domed lights, each with a diameter of 2.6 metres. Every time a vehicle passes, a flash is activated. 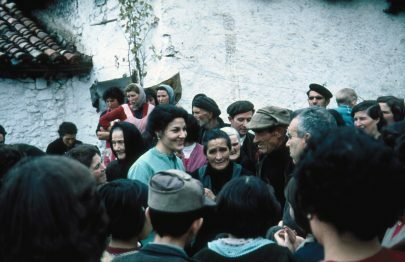 The source of material was family photos from the 1960. 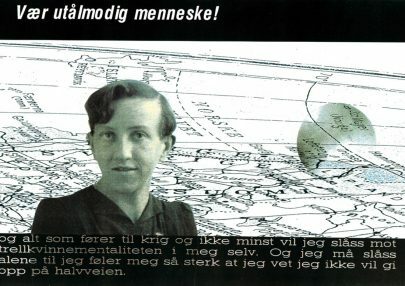 Eva Koch used slides put into sequences and with emphasis upon certain details. The slides were shown from three dia carousels placed in the middle of the room, changing continuously. 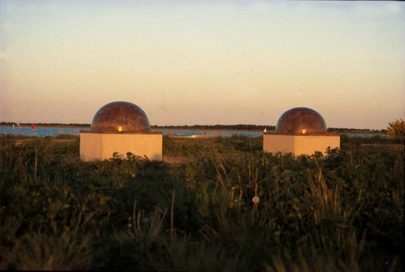 The series had titles as “In Spain”, “Between Sea and Sky” and “Portrait”. 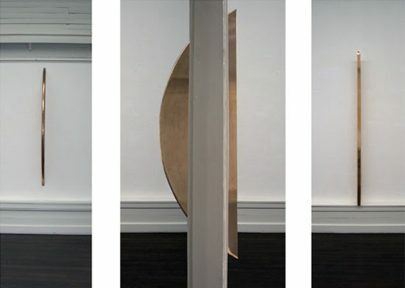 In Sculpture with Wall it is the wall that functions as a plinth with the segment of a circle apparently breaking through a wall. Looking from either side of the wall one sees only a bronze form, two bronze surfaces. Only when the observer unites the two views in his mind, does the actual form of the work emerge: a section or a fragment of a circle. As is the case with virtually all Eva Koch’s works, it is the observer who synthesises the work, the observer who, so to speak, become the place where the work comes into being. 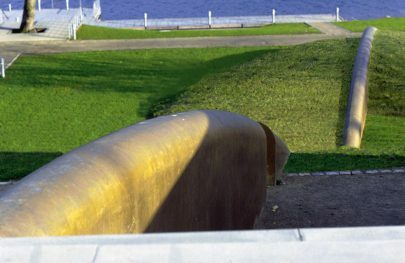 The sculpture is made of polished bronze and is more than 300 meters long, stretching from Algade to Skanderborg Lake. 300 meters is the actual distance from one end to the other of the sculpture, which in fact only appears in larger or smaller fragments. A garland around a large department store whispering NoMadLand. No mad land or nomad land? And doubt spread, for why this conjuration? And when one had squeezed ones way out of the absorbent mass of jostling bodies inside, the fragile human voice insisting on civilization as opposed to the oblivious inferno from which one had just emerged seemed sinister, almost prophetic. 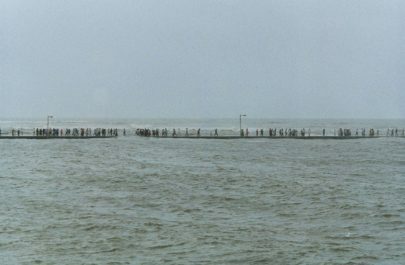 On a thin line, a narrow mole extended between sky and sea, human figures walk and walk. Their passage is not without risk. Powerful waves are constantly crashing on the mole, sweeping over the mole and the walkers. The video Transit is about being on one’s way, ‘in the gap’, between here and there. Transit means the state of being moved. 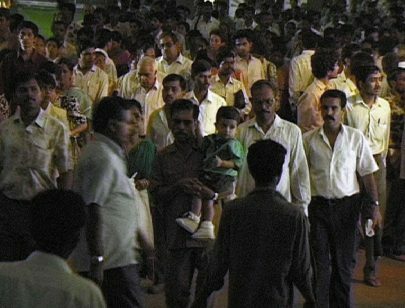 In “Crowds”, the large video installation from 1997, Eva Koch has placed herself in the middle of the crowd of three major cities: Jerusalem, Bombay and Hong Kong, and allowed the camera to roll. The project was shown as a series of billboards using the same medium as advertising communication in modern urban life. The series presents a portrait series of Nini Haslund Gleditsch, who is wellknown in Norway for her lifelong political commitment and her work for peace. 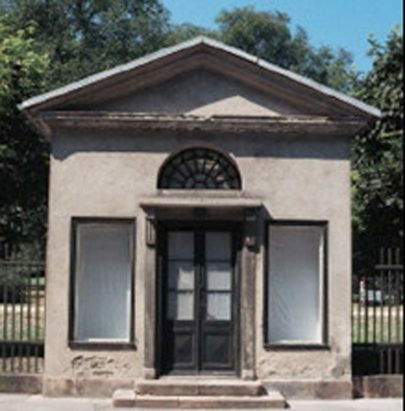 Mind the Gap was housed in one of the small pavilions bordering Kings Garden in Copenhagen. The room was bare. Empty and white, but at the same time filled with a strong light and sound. The empty space, the space that can never be entered, since it would no longer be empty, was ominous, singing a deep tone so that the building was almost resonant with it. 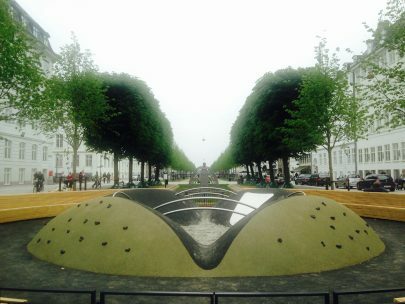 The sound sculpture in 1993 on Vilhelm Thomsens Plads in Valby is formed as the top of a sphere. 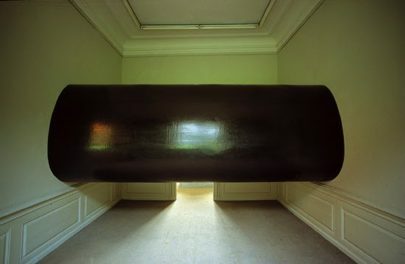 A mat, black dome breaking free of the earths grasp or a sinking globe. Slightly dangerous, but at the same time a calm and stable element in contrast to the restless surroundings. 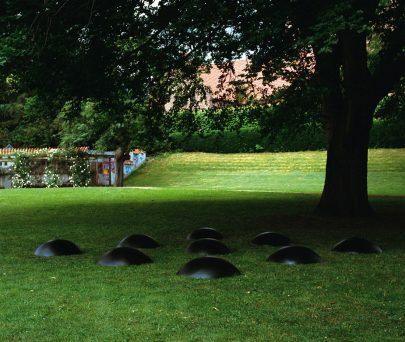 Placed in a square in the urban space the sculpture establishes a centre around which the space gathers. 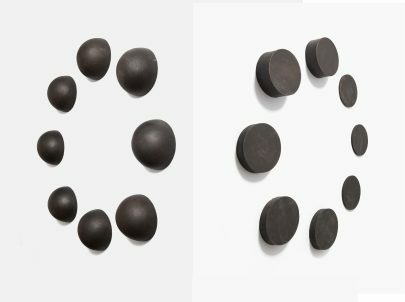 Eva Koch makes a “now”, pronounced in 9 different languages, spring from point to point. 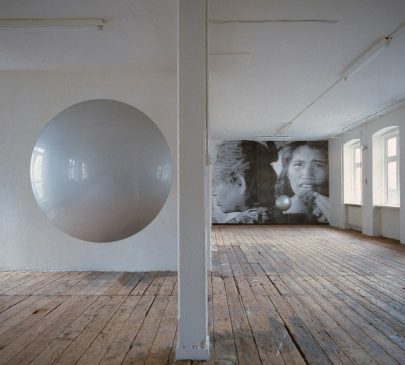 Photocopy at wall and 2 sculptures of painted steel. If the top of a sphere becomes sufficiently small, it is no longer defined as part of a sphere, but as a point. 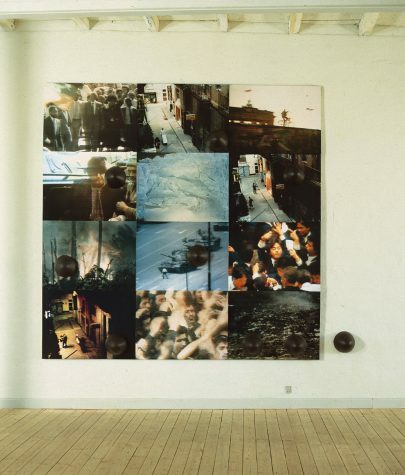 In Eva Kochs work these points can appear as markers in a field of images taken from the uninterrupted outpourings of TV, as in the untitled work exhibited at Brandts Klædefabrik in 1993. 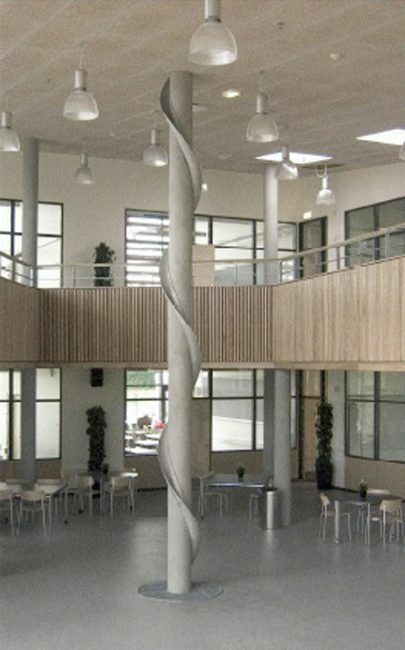 Double spiral of aluminium sheets. In one room there is a halogen lamp, 1000 w, in the other there are 2 video channels. One showing glimpses of world events and the other showing a street over 24 hours.